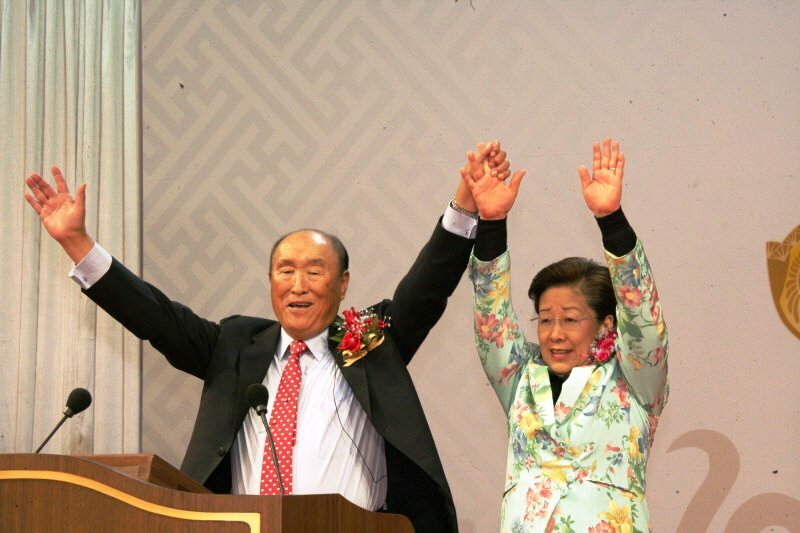 Cult leader Sun Myung Moon is fighting for his life, according to reports. Moon, 92, recently came down with a cold and pneumonia, which worsened. He now lies unconscious in the intensive care unit of a hospital in North Korea. As of Friday, his breathing had become more stable. Doctors have given him a 50-50 chance of recovery. Moon himself has 14 children through his second wife Hak Ja Han, who is referred to by followers as the “True Mother.” Most of their offspring live in the United States. He divorced his first wife, Sun Kil Choi, in 1953. They had one child, a son, together. The cult leader also owns a number of well-known American businesses, such as the Washington Times newspaper, United Peace International, the New Yorker Hotel in Manhattan and Kahr Arms, a pistol manufacturer in New York and Massachusetts. Additionally, Moon owns Pyeonghwa Motors, the sole automotive manufacturing plant in North Korea, as well as a number of Sushi restaurants around the world. Followers have called for 40 days of prayer for Moon. While the organization claims to have millions of followers around the world, experts estimate actual numbers as being no more than 100,000.